A group of scientists trapped in the remote rainforest. Entomologist Howard Duncan has a generous grant and a wealthy lover. Now he's on the verge of a find in the Brazilian rainforest that will reenergize his career: the rarely sighted reptilus blaberus, an insect like no other. But something has changed - nature has started producing an antidote to the fungal infection that previously held the insect population in check. Skeletons provide Duncan and his team with an ominous first clue about the potential consequences. And as the hunters become the hunted, the team must fight for their lives if they want to survive the terror-filled night. Insects was a book I picked up on Amazon after seeing it pop up as a recommend read. As soon as I read the premise I knew this was a book I needed in my life. I love books that take something as simplistic as a jungle dwelling insect and make them terrifying. Now throw in a group of naive scientists thinking they'll be the one to make their claim to fame by catching said insect and you have a real page turner on your hands or so I thought. Unfortunately while the premise to Insects is stellar it's execution of the plot failed big time. One of my biggest issues with Insects is that I wasn't actually scared for any of the characters. Sure they were in a forest filled with man eating insects and beasts alike but for the most part it just felt that I was watching a b-rated version of Lost instead of something more akin to say Arachnophobia which puts the threat to the characters and the population at large front and center. While the plot wasn't necessarily bad I do wish that the threat was more real for these characters. The story is very much a slow burn in the suspense department. Rather than the insects and the situation the scientists are in feeling like a big threat everything instead feels like a major inconvenience instead. Another issue I had with the story is the length. I truly believe this book would have worked better as a novella. Instead were given pages upon pages of filler dialogue that really didn't progress the plot along as well as it should have. Also due to all that filler dialogue we hardly ever see any real action. More showing and less telling would have really saved this book from being just OK to really great. At least in my opinion. Now one thing I really did enjoy about the story were the insects themselves . Basically the reptilus blaberus are a short living insect species whose population was kept in check by a fungus that grows in the jungle they inhabit. That is until the fungus stops working. Now not only are humans at risk but so are any creatures that are unfortunate to cross their paths as well. As the colony grows their threat increases and if it escapes the jungle.... Well, let's just say it will be very bad for all life indeed. Overall, Insects provided me with a relatively decent story for the price and kept me curious enough to continue with the series should I ever come across the next book in the series on sale (would not pay full price though). I'd recommend picking this one up only if you don't mind a story with a slow build up and also one filled with sometimes boring scientific conversations on nearly every page. 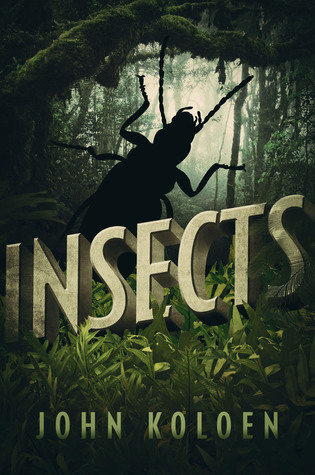 With that being said, I'll be rating Insects by John Koloen ★★★. *Copy reviewed purchased. All opinions are my own and I was not compensated in an which for providing them.